The compact Ubiquiti EdgeSwitch 8-150W is a fully manageable, high capacity PoE+ Gigabit device. The device provides high capacity and intelligent switching technologies. 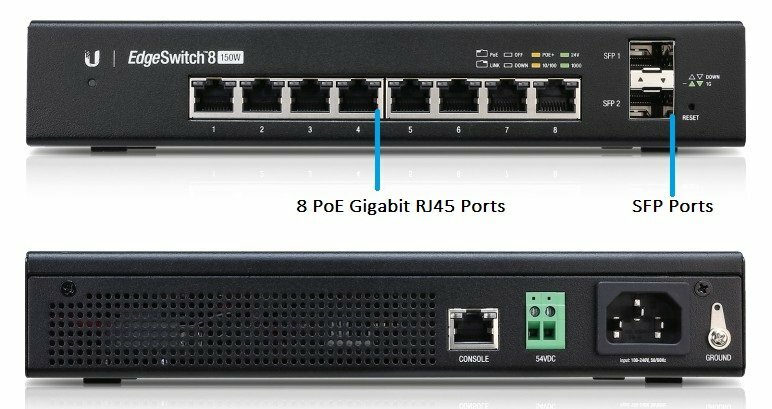 The EdgeSwitch 8-150W offers versatile port configuration - it is equipped with 8 RJ45 ports that support PoE+, 2 SFP fibre connectivity ports and 1 Serial Port Console. It is perfect for building a stable LAN segment or for the development of the existing structure. The ES 8 150W can be placed on a desk or mounted on a wall. The Ubiquiti EdgeSwitch 8-150W is a confirmation of the manufacturer's high quality solutions. It is CE, FCC and IC certified. It can be used at temperatures ranging up to 40 degrees Celsius.